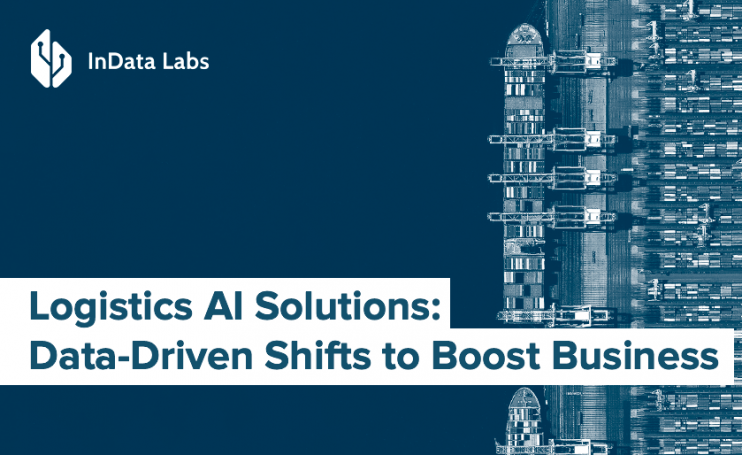 The report by Accenture reveals that 36% of large-, mid-, and small-size organizations have successfully adopted AI for logistics and supply chain processes. And 28% of the survey respondents are at the threshold of deploying AI in this field. The artificial mind is also claimed to increase productivity by more than 40% by the year 2035. And AI revenue growth in logistics is axiomatic since the technologies are already revamping the industry in different aspects. Artificial intelligence encompasses systems that can mimic, automate, replicate human thinking and take data-driven actions more effectively than humans do. In other words, AI shares some common abilities with humans. Such are the abilities to perceive various types of information, understand different datasets, learn in many ways, and generate solutions. To be able to imitate human thinking, artificial systems require significant volumes of data as the input about any process. AI-based systems can process text, image and video, and sound data similar to what humans can through senses. A key performance metric for such systems is the error rate. High-end AI-driven voice assistants demonstrate the error rate of 5%. Such is the performance rate that IBM reports describing the state of the technology. So, the more mature becomes speech-, text-, image-recognition technologies, the more advanced are the functionalities of AI-driven systems. The network-based nature of logistics makes the industry perfect for adopting and using AI best practices. At IBM, the researchers estimate that relatively moderate investments generate a much larger ROI than before. The complexity of AI is growing: more unstructured data, complicated algorithms, high-level tasks, etc. And the output of AI to amplify transportation services and global supply chains increases as well. Global providers, such as Amazon, take great care to ensure high-level delivery services and first-class customer experience. To fulfill these goals, logistics and supply chain business owners give much attention to back-office automation. They delegate repetitive and detail-oriented tasks to robots and then to an artificial mind. Machine learning makes AI capable of accumulation knowledge based on human decisions, make judgments and interact with humans. Other less complicated tasks can be completed with the help of robotic process automation (RPA). RPA-powered systems are rule-based and can help automate mundane tasks. Among these tasks are accessing shipping data, filling in some invoices and web forms, distributing data to the right database. Finally, the data becomes accessible to AI. The use of robotic units for data-related repetitive tasks offer businesses significant perks. Amazon employs more than 100,000 warehouse robots that can already take over from human employees in many aspects. And as the statistics by EY – one of the largest accounting firms – claims, this can enable cost saving up to 65%. Implementing AI in transportation can help reduce the burden on logistics accounting teams. Many providers in this industry cooperate with third-party vendors to ensure safe and high-quality transportation processes. It results in a large number of invoices and other documents that a logistics provider’s team has to deal with. AI-based systems and natural language processing (NLP) technologies can assist in working with massive volumes of unstructured data and extracting critical information on received billings, addresses, dates, etc. Among other things, the use of technologies to automate accounting tasks significantly contributes to security. To provide an example, EY uses an ML-based system to monitor anomalies in invoices, classify documents, verify the compliance with different regulations and more. The system demonstrates great performance: it tackles fraud detection with 97% accuracy. Large-scale supply chains have to manage numerous vehicle assets and premises worldwide. NLP-based systems make it easy to tackle these challenges. They help process and classify related contracts, review long legal documents, keep customer information up to date, verify delivery data, eliminate duplicate information, and on and on. Traditionally, such tasks require the involvement of whole departments, which is expensive and unproductive. However, AI systems still require human supervision: a human-in-the-loop approach is the best one when it is needed to review the output provided by AI. Another example is the AI breakthrough in rail transportation. AI technologies can be used to build fully autonomous rail systems with smart infrastructure and self-driving trains for carrying cargo and people. The trains will also interconnect with other trains, exchange data, receive notifications from human managers and take notification-based actions. What is more, AI and rail transportation are inseparable when it comes to predictive maintenance. Intelligent systems enable real-time equipment analysis and mechanical issue detection both locally and remotely. Global supply chains employ different means of transporting including air freight carries, railway transport, waterway shipping. The providers face an acute need for risk management solutions to solve industry-related challenges. Different problems, from natural disasters to partner’s in-house issues, can cause disruption in supply services provision. AI can help suppliers mitigate risks and generate predictions to prevent possible breakdowns. ML-solutions combined with NLP can be used to gather meaningful data from multiple social media sources, process unstructured text, conduct sentiment analysis, and indicate possible risks. Likewise, AI-based systems can use digital and satellite maps and information about traffic to help optimize routes. The system can take into account and process in the real-time mode time, place, traffic state, changing customer demands. IBM specialists believe that across every asset-intensive industry, i.e., transportation, organizations are challenged with how to maximize the value of assets throughout their lifecycle. It is undoubtedly true. As a leading management consulting firm McKinsey Global Institute reports, predictive maintenance will help organizations save up to $630 billion by the year 2025. The deployment of AI for maintenance purposes is a powerful asset management solution for large-scale organizations. The better is the maintenance of an asset, the higher is the performance, and longer is an asset’s life. AI-driven systems automatically gather and analyze data about assets and warn about possible breakdowns. Such systems can accumulate information about failures, draw up statistics and, based on this statistical data, schedule repairs. If a provider can guarantee the employment of available and reliable assets, it will help gain a competitive edge and trust of services consumer. Leading logistics organizations are already harnessing AI and machine learning. To put it plainly, AI-driven technologies are developed to mimic and imitate human thinking and to exceed humans in terms of the efficiency of data-driven decision making. AI is the best assistant for global supply chains in managing assets and facilities in the most cost-efficient way. The use of AI-based predictive analytics can help transportation services providers optimize route planning and delivery schedules. Also, the technology-based approach ensures improved asset performance due to timely maintenance, which results in the reduction of cases of failures. To date, the capabilities of logistics AI solutions seem boundless. Everything depends on your organization’s needs and project requirements. 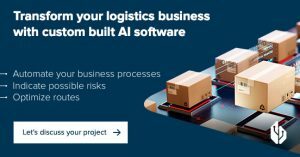 It’s high time to bring AI to logistics processes within your organization, and our AI product development team is ready to help you.